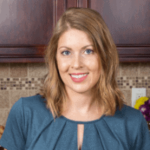 Published: Jun 19, 2017 · Modified: Apr 12, 2019 · By Jen Sobjack · This post may contain affiliate links. 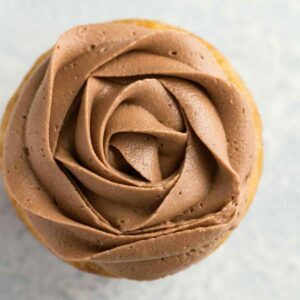 Rich and luscious Nutella Frosting will have you swooning! A basic buttercream with the addition of Nutella will complement all your favorite cakes. The recipe is so simple too and incredibly addictive. I have a slow growing archive of frosting happening here! That’s not a bad thing though. There’s always room for more frosting. Several months ago I decided to focus on testing and shooting some of my favorite frostings used on various cakes and cupcakes throughout my site then add them to their very own category. This makes it much easier to find a great frosting when you’re looking for the perfect one to pair with that cake you just made. I share this Nutella Frosting recipe a couple years ago on top of banana cupcakes. 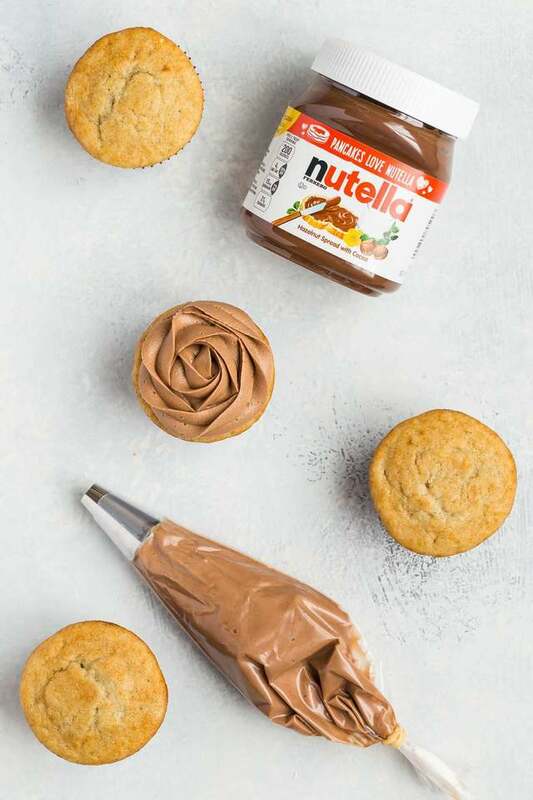 I suggest you print the recipe for banana Nutella cupcakes right now and get to baking. You won’t regret it! The frosting is incredibly luscious. It’s full of chocolate hazelnut flavor and so silky smooth. You only need four ingredients for today’s frosting – butter, Nutella, confectioners’ sugar, and a dash of salt. A little salt helps tone down the sweetness of the frosting. It’s magical. For this recipe to work properly, you’ll need to start with super soft butter. Typical I suggest letting it sit a room temperature for half an hour or so but today we’re letting it soften for at least an hour. An hour and a half is best! Super soft butter will meld easier with the thick chocolate hazelnut spread. I also recommend beating the two together for at least two minutes. It should look silky smooth and shiny. Once the butter and Nutella are well combined it’s time to add the salt and confectioners’ sugar. I like to add one cup of sugar at a time and mix it until it’s no longer powdery after each addition. After adding the last bit of confectioners’ sugar turn the mixer up to medium-high speed and let it whip for two minutes. The frosting should become creamy and fluffy. This consistency of the frosting is perfect for piping. It holds its shape nicely. Or it can also be spread over cakes with an offset spatula. Either way, this frosting won’t disappoint. 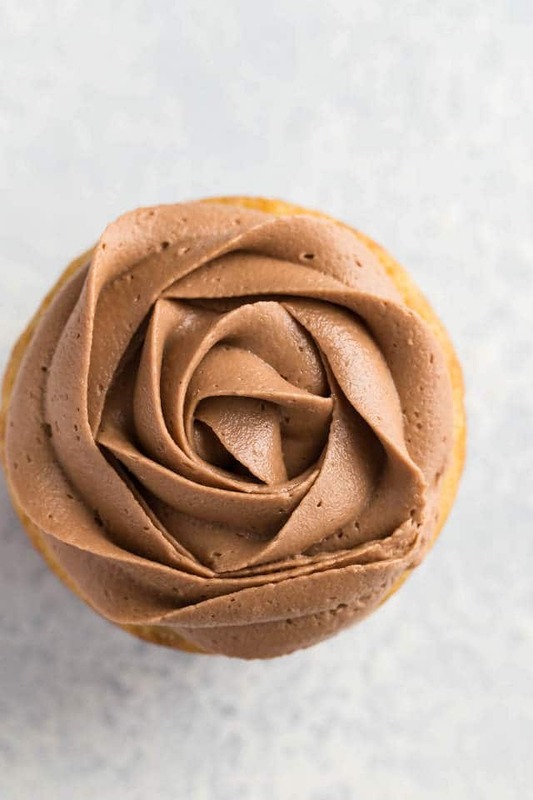 Rich and luscious Nutella Frosting will have you swooning! 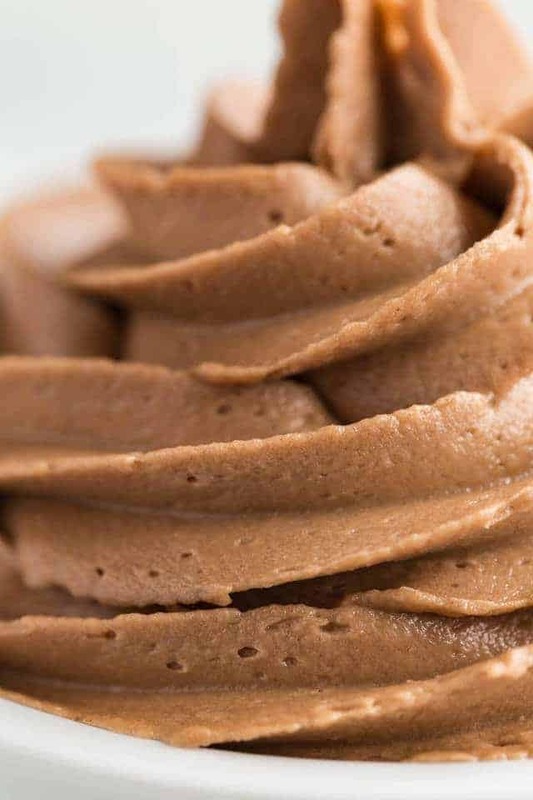 A basic buttercream with the addition of Nutella will complement all your favorite cakes. The recipe is so simple to and incredibly addicting. In a stand mixer fitted with a paddle attachment or with an electric hand mixer, beat the butter on medium-high speed until smooth. Add the Nutella and salt. Continue to beat until incorporated, about 2 minutes. Add 1 cup of confectioner’s sugar, beat on medium-low speed until most of the sugar is moistened. Gradually add the remaining sugar until the frosting is the desired texture, beating on medium-low speed until the sugar is moistened. You may need more or less sugar depending on how you plan to use the frosting. Add the heavy cream and beat on medium-high speed until light and fluffy, about 2 minutes. Scrape down the sides of the bowl as needed. Frosting will keep for up to 4 days stored in the refrigerator in an airtight container. Let stand at room temperature to soften before use. Or it can be frozen for up to 3 months. When ready to use, place in the refrigerator overnight to thaw. Let stand at room temperature to soften before use. It’s important to use very soft butter for this recipe. Set the butter out on the counter for at least 1 and 1/2 hours before using. It came out perfect! I substituted hazelnut creamer for heavy cream to enhance the hazelnut flavor. My friends loved it! Thanks so much! I will be checking out more of youe recipes. Hazelnut creamer is a fantastic idea! Thanks for sharing! Sounds good but where’s the recipe? No measurements are given. Is this a just make your best guess on how much of each ingredient? The full recipe with ingredient amounts is right above where you left this comment. I made this frosting yesterday to go on chocolate cupcakes… While the flavour was very good, I didn’t get the texture right. It was not at all firm. Couldn’t pipe it on the cupcakes. I had been playing around in search of the perfect Nutella frosting and have failed. I’m so happy I’ve found your recipe, and just in time for a birthday party! It was so creamy, smooth, and really nicely fluffy! I doubled the recipe for a three tier cake and have about 1/3 of it left which will go in the freezer. Wonderful recipe and so easy too! Thank you so much for sharing. I’m so happy you loved the recipe! I think this is the BEST FROSTING I have EVER made! I could have literally eaten it from the bowl with a spoon. Everyone at the baby shower raved about how delicious the cupcakes were, and this frosting recipe has definitely moved to the top of my favorites! Thank you so much for a recipe that turned out perfectly and was perfectly delicious. Hello I love the recipe, but i had a probem I overbeat the frosting,does anyone knows how can I fix it? Thanks. This recipe for the Nutella frosting is just what I have been looking for. Some time ago, my daughter and I were at a large grocery store and happenened upon the mark-down section. There were small jars of a spread that is made by Biscoff marked half off. My daughter was thrilled and I said, “What is it?” She said, “It’s divine!” When I asked what do you eat it with, she said, “A spoon!” Of course she was kidding and that wasn’t what I meant, but is was just divine! I’ve never seen it since, but now I don’t have to because you gave me this recipe. I bet yours is just as yummy!